Witness one of nature’s most spectacular transformations up close with this reusable, collapsible habitat. Fine, transparent mesh lets you see butterfly metamorphosis up close. Product includes easy-to-use feeder and complete instructions for habitat. 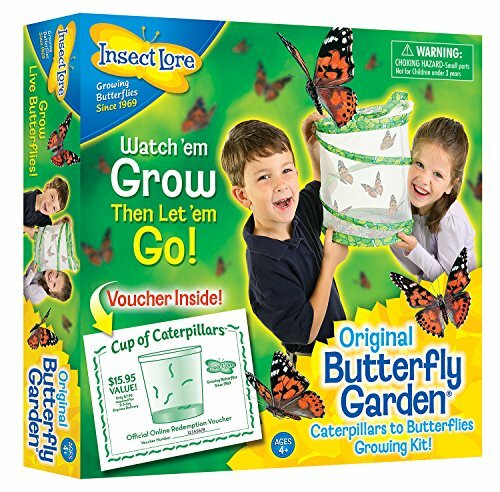 Butterfly larvae with food shipped directly to your home. The habitat collapses for storage when not in use. You can adopt and raise a handful of caterpillars, watch them transform into painted lady butterflies, then lift the garden cover to release your beautiful specimens into the wild. This exciting habitat makes a fabulous introduction to the miracles of nature. The larvae and food available round the year.